Having read the synopsis and looking at the cover, I was really looking forward to reading The Belles. After reading the opening chapter, I had a feeling that this book could be like The Hunger Games if Effie was selecting an Apprentice to work for her. It just had that overall feeling to it. However, the book quickly changed and the book became more about a young woman who is desperate to succeed in a Royal Court that has strong hints of corruption. This is where I think The Belles ended up at a disadvantage, at least for me. Last month I had finished and LOVED The Cruel Prince by Holly Black. This book had another heroine who wanted to get the coveted spot in the Royal Court of fey. Camellia and Jude are very different characters, but their overall arc is very similar and this caused me to compare the two books. It also meant that my enjoyment was lessened slightly over The Belles. 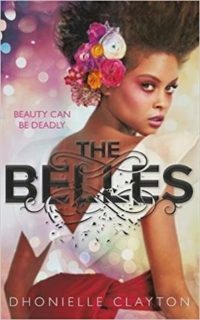 However, the saving grace to the Belles is the actual world building and the growing mystery about The Belles and their place in society. This mystery began before Camellia joined the Royal Court, with the mysterious crying heard in the Tea House she worked in. There are whispers of “other Belles” but when she questions the caretaker of the Tea House, she is shot down. The Court Intrigues really start to get interesting, with the sleeping Princess Charlotte and the sudden departure of Camellia’s sister as the Favourite driving the book along. The descriptions of the transformations that Camellia does is very well described and you are drawn into the moment. The transformations sound brutal and you can see the toil it takes on Camellia. Deep down I knew that there would be some price to pay for Camellia and the other Belles using their gifts. This is explained, but the biggest surprise I found was the actual creation of Belles and what this means going forward in the series. As a character, Camellia took a little while to warm up to. I did find it a nice change to see the lead having an obstacle placed in their path very early on in the book. She wasn’t given the accolade as Favourite straight away. Camellia had built it up in her mind that she would be the favourite, so she has that much more to prove when she becomes the Favourite by default. Every book needs a good villain and Princess Sophie, the Queens second daughter has the evil streak in her that would make Cruella De Ville proud. She also could give the evil Stepsisters from Cinderella a run for their money. I did guess her true motives very early on in the book, but I couldn’t help being drawn to her as a character. 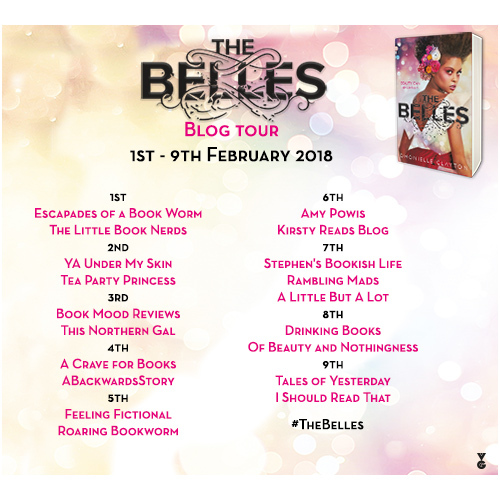 For a debut novel and the first book in the series, The Belles is off to a pretty good start. The ending has a real cliff hanger and I want to see what lies ahead for the characters. I really think that had I not finished The Cruel Prince recently I would not have compared The Belles to it. However, it does show that Young Adult Fantasy books are evolving and that Romance is not the driving force in the books. Female characters are trying to carve out their own destiny’s in repressive worlds. The Belles is a promising start to a very unique and vividly created world. The tagline of Beauty being deadly really does prove true. The wait is now on for the next book in the series.